See our latest Trend Map! What to expect in 2008 and beyond…. 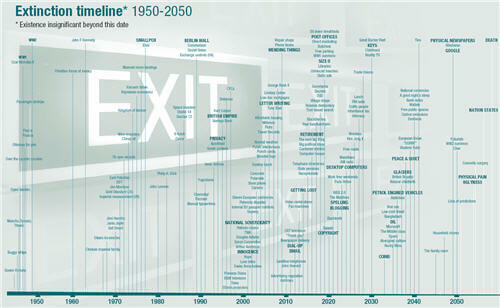 Nowandnext.com and Future Exploration Network have once again collaborated to create a trend map for 2008 and beyond. Our Trend Map for 2007+ had a major impact, with over 40,000 downloads, fantastic feedback (“The World’s Best Trend Map. Ever.” “I got shivers” “Amazing” “Fascinating” “Magnifique” etc. etc. 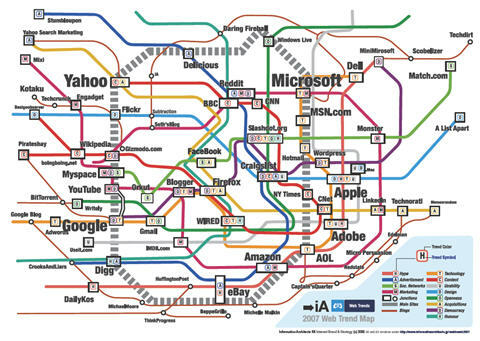 ), and inspired several other trend maps including Information Architects’ first map of web trends. 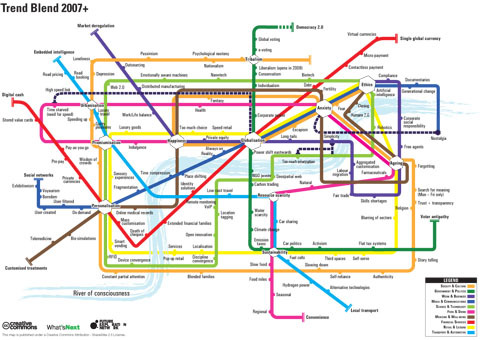 While last year’s map was based on the London tube map, the 2008 map is derived from Shanghai’s underground routes. Limited to just five lines, the map uncovers key trends across Society, Politics, Demographics, Economy, and Technology. Click on the map below to get the full pdf. https://rossdawson.com/wp-content/uploads/2016/07/rdawson_1500x500_rgb-300x100.png 0 0 Ross Dawson https://rossdawson.com/wp-content/uploads/2016/07/rdawson_1500x500_rgb-300x100.png Ross Dawson2008-01-21 02:06:182008-01-21 02:06:18See our latest Trend Map! What to expect in 2008 and beyond…. The latest Teens and Social Media report from Pew/Internet gives some great insights into how teens aged 12-17 are using the Internet. The fact that close to two-thirds of teens create and share content on the Internet underlines the fact that we are moving into the Participative Age. In fact close to a quarter of over-65 years olds also create content on the Internet, however generational change will see a world in which we take it for granted that we all create and share in some form. When people talk about the future, they usually point to all the new things that will come to pass. However the evolution of human society is as much about old things disappearing as new things appearing. This means it is particularly useful to consider everything in our lives that is likely to become extinct. Below is the Extinction Timeline created jointly by What’s Next and Future Exploration Network – click on the image for the detailed timeline as a pdf (1.2MB). I was recently interviewed for an excellent article in IDM magazine titled Democratic participation ignited by the power of many, which explores the potential of e-democracy. “Mass media will always exist. People will always want a common perspective on the world. But we are definitely seeing a fragmentation of media,” says Dawson. “Of course there is always the issue of the credibility of the source. But often for credibility, people will simply turn to mainstream media,” says Dawson. Although citizen journalism is opening the doors for anyone with Internet access to have their say, it may not progress ‘democracy’ but it does improve on the dissemination of information and debate. “In the past we had to rely on press releases and reports for our information, now we have access to everything,” says Dawson. “As you get input on creating outcomes, emergent results occur, emergent outlines where you can’t predict the outcome,” says Dawson. “Things get better with the more people that use them. You see what’s popular, what’s relevant, different approaches and bringing together of different data-sets. There are many layers to the potential of e-democracy. The domain of transparency and dialogue, on which I was quoted here, is the first. In the US presidential elections, already in full swing with 15 months to go, there is already substantially improved engagement by voters over previous elections. People have access to – and often choose – far more diverse sources than the mainstream media in forming their opinions. The power of bloggers was amply demonstrated by the line-up of all major Democratic candidates at the recent YearlyKos convention of political bloggers. There is real participation in political dialogue, whereas before the messages were almost all filtered through mainstream media. This is not to say that all is rosy in American democracy, or the way in which issues are discussed. However we are far closer to participatory democracy when discussion of the key political issues is participatory. There seems to be a trend for trend maps! Back in late December Nowandnext.com and Future Exploration Network released a map of major trends for 2007 and beyond, as below. My original blog post described some of the background to the trend map. 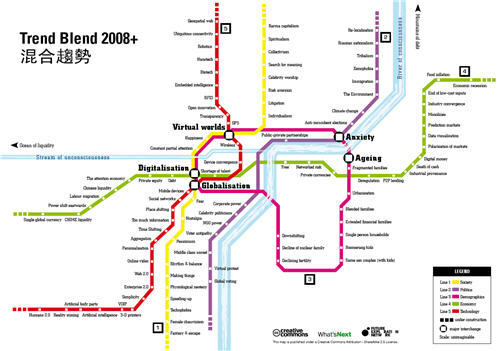 A few days later after we released our map, Information Architects, seemingly inspired by our map, created a map of web trends, based on the Tokyo subway map. Their map seems to have got even more attention, helped by blog posts from some of the A-list bloggers featured. They even scored an article in Sankei Shimbun, a Japanese business newspaper with readership of 2.8 million, as well as other media uptake in Germany and Italy. In the course of exploring the impact of these trends maps, I came across GreatMap, a fabulous site that has hundreds of links to fabulous visual representations. It’s well worth a browse through its links to see some of the work being done in visualization. We are clearly rapidly shifting to an increasingly visual culture. As our world becomes increasingly complex, particularly when we consider the extraordinary possibilities of the future, words and linear structures fail us. We respond to visual representations that help us to make connections, even if they’re more fun than serious, as for our trend map. As a result, we’ll continue to produce more visual representations of interesting trends and the future – coming up soon! Can technology create world peace? I was interviewed for a podcast today by the enormously energetic Sanjana Hattotuwa, for his ICT for Peacebuilding blog. Sanjana’s overview of our broad-ranging discussion is here, and the podcast is here. While we covered a lot of territory, including reputation systems, getting traditional media to adopt social media technologies, global innovation networks, and more, the heart of the conversation was about technology’s ability to support peace and a better world. This is a particularly pointed issue in Sri Lanka, where Sanjana is based, with violence now on the rise again. Certainly social media in particular gives us all access to a far broader range of views and opinions. Yet this doesn’t necessarily change people’s attitudes. The increasing polarization of the political debate in the US, and arguably globally, suggests that the rise of social media is not a universal panacea. Claims were made when both the telegraph and the telephone were introduced, that they would help bring about world peace. In fact, it can be easier to dehumanize people and opinions when discussion is intermediated by technology, thus creating more extreme expressions of disagreement or even hate. For decades it has been recognized that a key factor in people’s social networks is how diverse or similar their connections are (what Everett Rogers called heterophilous and homophilous networks). Certainly being exposed to more diverse people and views can help to temper views, yet this often has to be in a face-to-face context, where it is far harder to focus on abstract differences and to ignore people’s humanity. Unfortunately, I believe there are some aspects of humanity that mean it will not be soon before we stop killing each other. I also don’t doubt that much hate will continue to be expressed in the online world. Yet part of the evolution of humanity that we are increasingly exposed to other cultures and views. Most countries around the world have reached the stage where they are truly multi-cultural. From being exposed to people further afield primarily through mainstream media and entertainment, the shift is now to direct interpersonal communication, and accessing voices, writings, and videos created by an extraordinary assortment of individuals. Greater appreciation and tolerance is, in the long run, a fundamental outcome of this (without expecting world peace overnight…). https://rossdawson.com/wp-content/uploads/2016/07/rdawson_1500x500_rgb-300x100.png 0 0 Ross Dawson https://rossdawson.com/wp-content/uploads/2016/07/rdawson_1500x500_rgb-300x100.png Ross Dawson2006-09-20 04:34:182006-09-20 04:34:18Can technology create world peace? One of the most successful business segments on the Internet has been matchmaking. People are prepared to pay to get in touch with potential mates. We probably all know people who have met their partners online (whether they admit it or not). Yet the way matchmaking is usually done is incredibly crude, based on checking a series of boxes, and being matched with people who check the same boxes. An advance on this science has been made by OKCupid, which among other approaches allows people to specify their own questions, rate the importance of these, and uses people’s matchmaking behaviors to assess their personal characteristics within defined confidence levels. To boot, the service is free. As a newly-married man I’m certainly not in the dating scene. However I do think it’s an important social function to enhance a key promise of the Internet: to be able to draw on the entire world in finding our perfect mate, as opposed to being limited to who we happen to bump into along the way. Business matchmaking is equally important. How do we find the people or organizations that we can create unique value with? There are a host of event-based matchmaking systems to enable conference attendees to hook up with interesting people. (More on this another time.) One of the most sophisticated is IntroNetworks, which asks people to position a whole range of business and personal topics along a spectrum of how interested they are in them. This enables them to identify with great accuracy the other people at the event who have the closest match of interests. Check-the-box profiling is so last century! Update August 19: A CNN news article quotes a Jupiter Research analyst who forecasts 9% annual growth in online dating revenue this year to US$516 million. The story is focused on the slowing in growth of the sector after a massive surge. However part of that has been due to the relative lack of innovation in the sector, thus the story above. Still, 1% of all Internet activity is attributed to online dating, which is pretty hefty. Social networking software such as Friendster and Google’s Orkut cross boundaries, including both dating and other personal networks. The story of Ruper Murdoch’s News Corporation recently acquiring the popular social networking MySpace shows that mainstream media are recognising the power and potential of social software. News Corp’s Australian media rival Fairfax recently paid A$40 million for Australia’s premier online dating service RSVP, demonstrating that this truly is a convergent media space.